This is double weave on twelve shafts. One layer is the gorgeous lapis lazuli blue. The other layer is neutral almond for contrast. 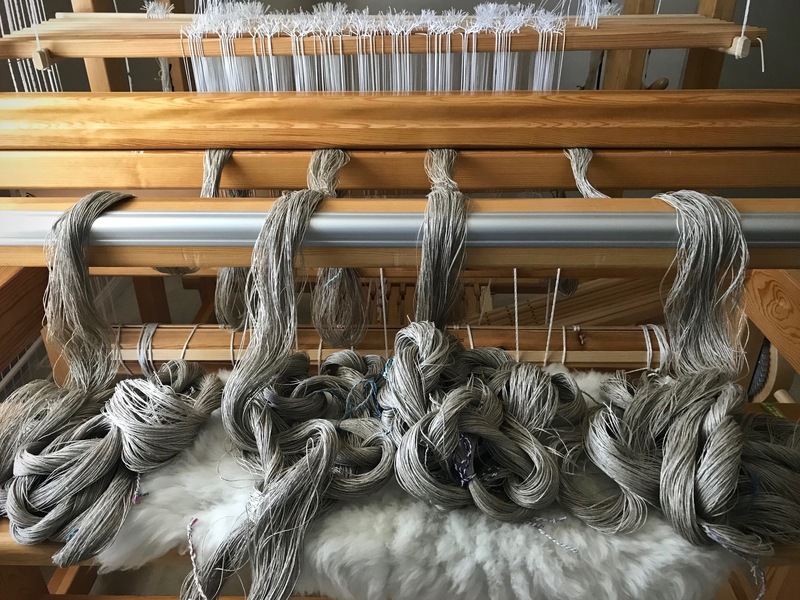 I am spreading and beaming this 6/2 Tuna wool warp with two sets of lease sticks—one set for each layer/color. Big fat warp chains. Double weave on twelve shafts, with 6/2 Tuna wool for warp and weft. When you have two sets of lease sticks, though, it is a serious challenge to get the two colors to alternate correctly as you move the end loops to a separate stick. The ends on the stick are then transferred to the back tie-on bar. I did breathe a sigh of relief when everything was finally lined up and in order. Two sets of lease sticks carries the challenge of having clear visibility of the lease cross in both warp layers. After one or two do-overs, all the yarn is successfully moved to the back tie-on bar. 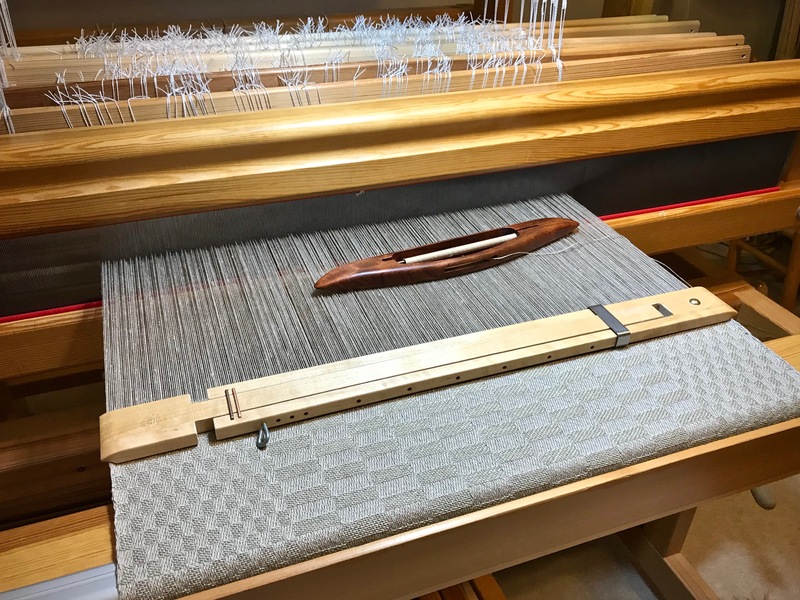 Moving from right to left, I separate and straighten each warp end on the tie-on bar. Only a few more left to straighten. Back tie-on bar all in order. 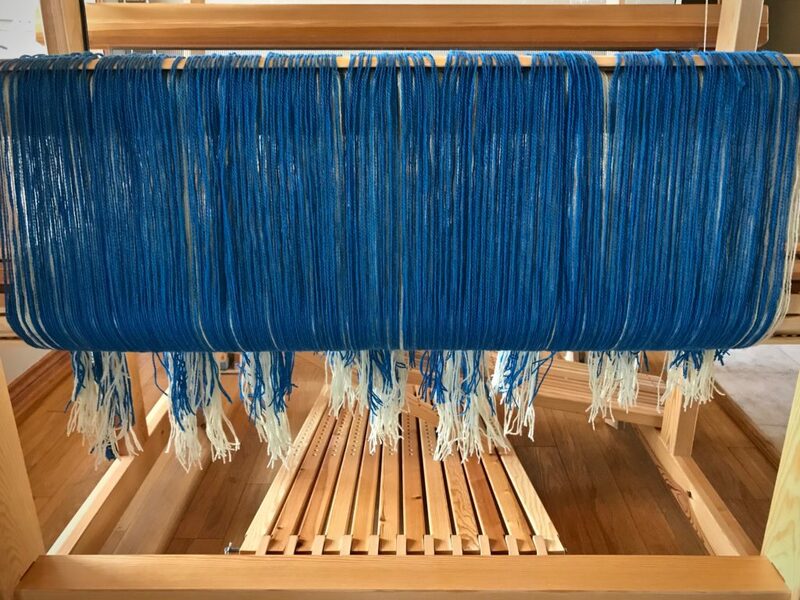 Now ready to move the pre-sley reed to the beater and begin beaming the warp. And I’m reminded again how beautiful a beamed warp is. It’s worth the challenges. Warp beam and back beam show the beamed warp. 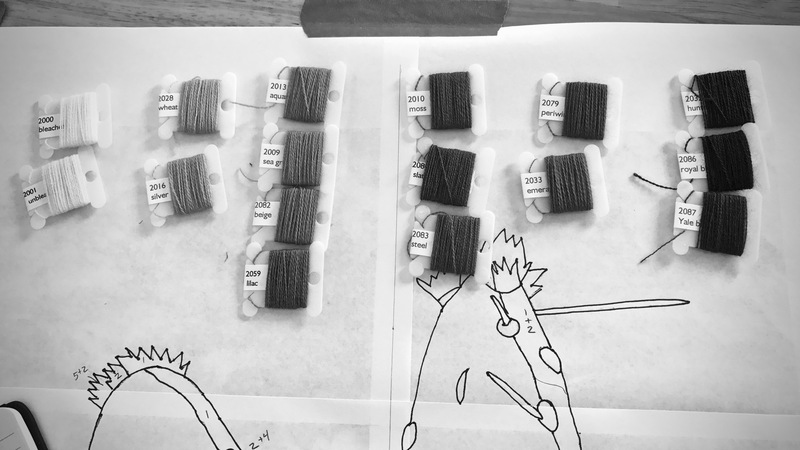 Separated into threading groups for the next phase of dressing the loom. That beautifully ordered wool on the back tie-on bar, now hidden from view, is an essential element for quality handwoven cloth. Kindness is that way. It’s a core trait deep in one’s character that is revealed in interactions with others. Kindness makes you beautiful. It’s not something you try to be. It’s something we wear. It’s our inner being dressed in the character of Christ. May you be dressed in kindness. So much more to learn. Thank you for showing the way. Off topic… My goal today is to post photos of the Wasaukee February 15, 2019 snow fall that the fuel truck had to deliver to. And my Yooper husband played in. Thank you for the the intense color of your post. White on white is nice in small doses. Hi Nannette, I’m glad to add some color to the beautiful white on white that you’ve experienced. You may be referring to the aluminum beam cover I have on the back beam (I have one on the breast beam, too). 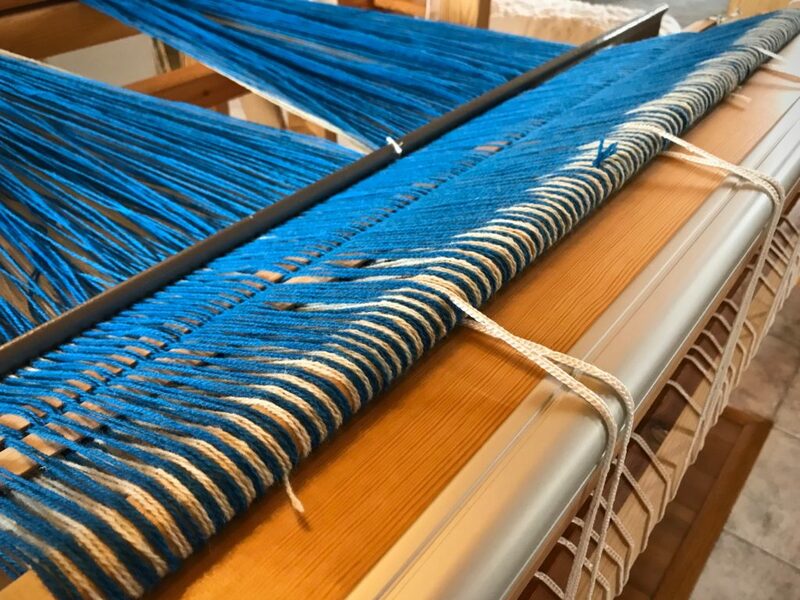 It protects the wood from getting grooves in it from the beam cords that run over it while beaming the warp. It’s a normal-size back beam, but I can see how the aluminum cover makes it look wider. I’m making a small wool blanket. There is beauty in cut threads. They signify completion. Look what has become of these linen threads! Order and sequence, timing and continuity, perseverance and pursuit. 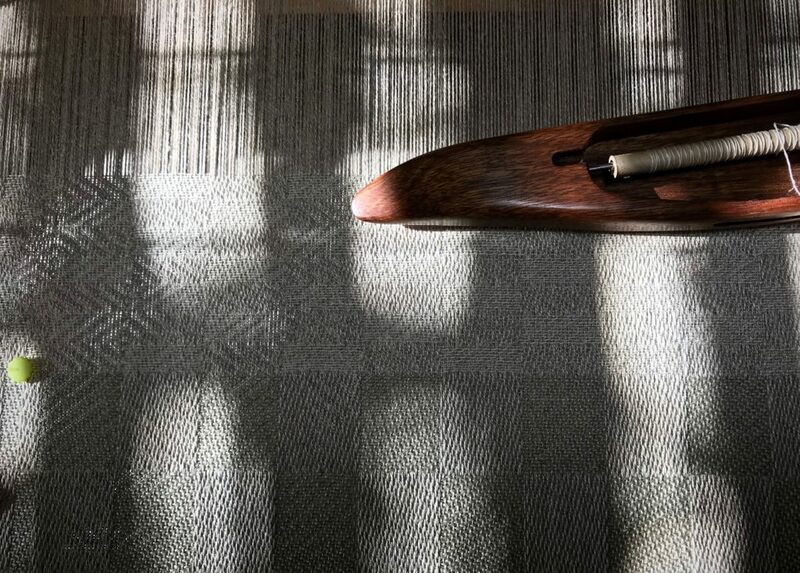 Through a weaver’s hands it all adds up to fabric made for a purpose. Cutting off! 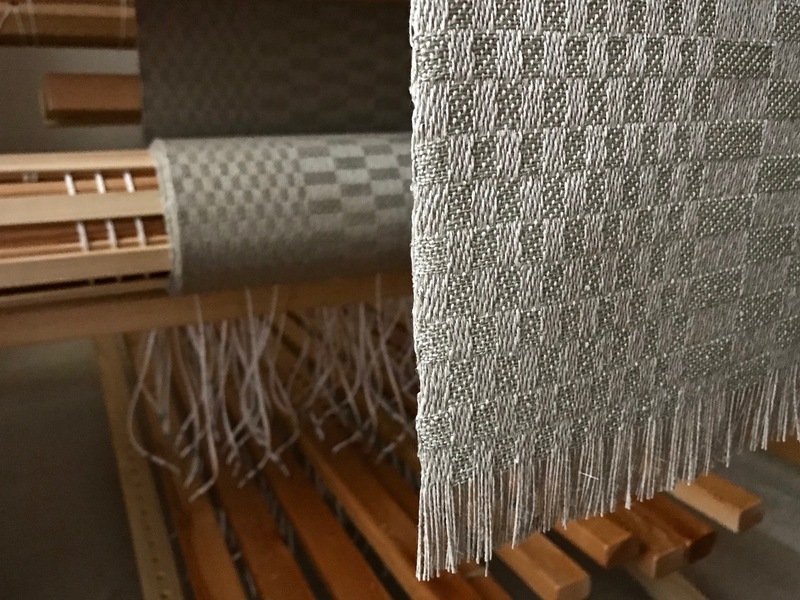 Linen warp ends flow through the reed like a waterfall after the cloth is cut off. Cut threads appear as tidy fringe on the stately linen satin damask weave. The warp beam holds the cloth until it is ceremoniously unrolled. 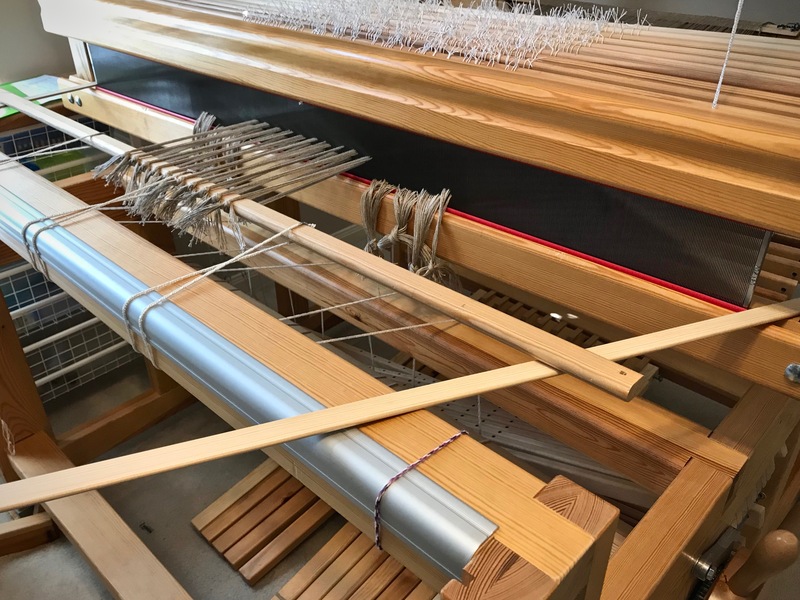 Fabric and warping slats fall to the ground. 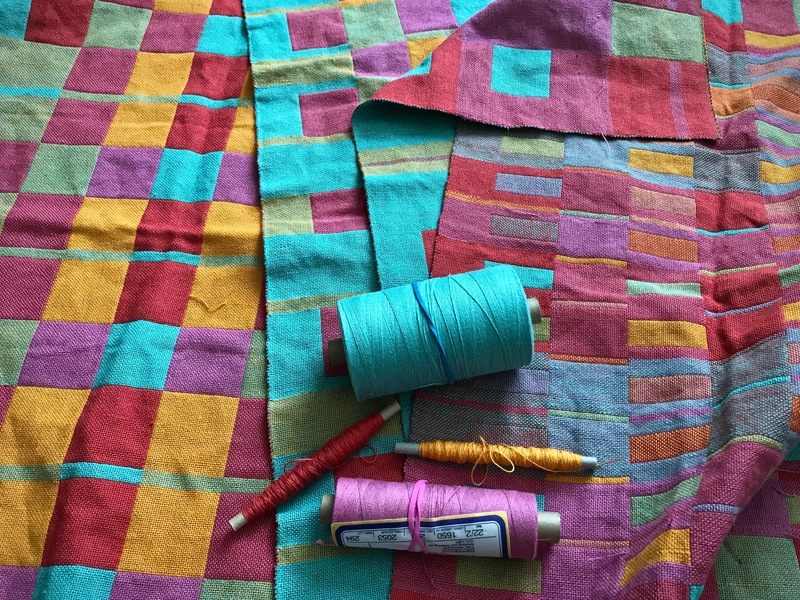 On the sewing room work table, the completed fabric awaits the finishing process. 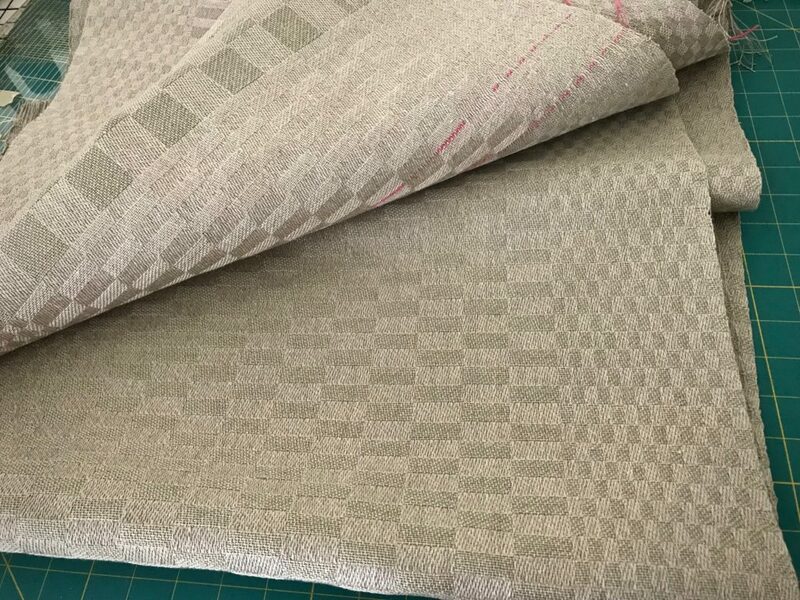 I will look for and repair errors, secure cut ends with serger stitching, and wet finish the fabric. Then, I will hem them so they can be used as the towels I envisioned from the start. May your threads turn into something beautiful. Beautiful tribute to Our Father who IS the Masterweaver! I just finished the second project on my Baby Wolf and it was a major learning experience, so it is a miracle that, as I cut it off, it really became the towels I intended to do! 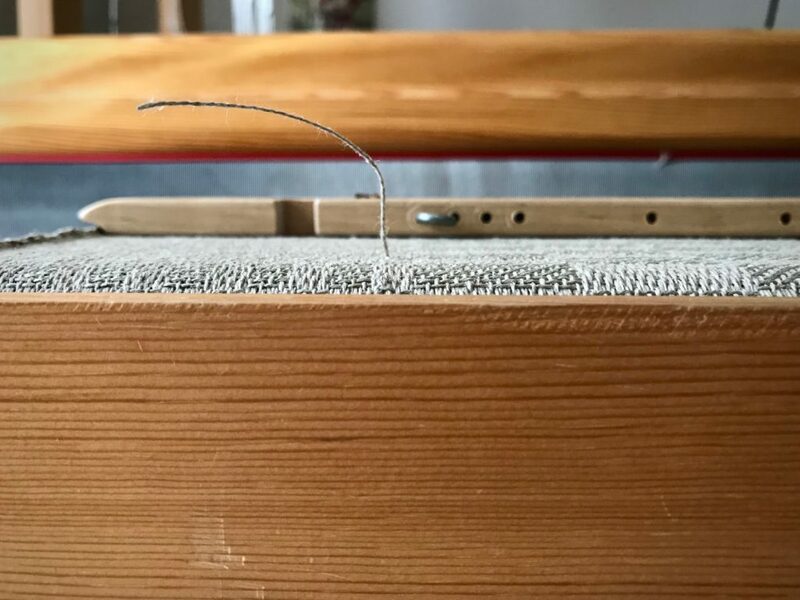 Lessons: (1) Make sure that the warp goes OVER the back beam (2) count the heddles more carefully to avoid need to make repair heddles…which sometimes come loose! (3) Use the right equipment, e.g. raddle that spreads the threads so they are straight. But, they will come off the loom this a.m. 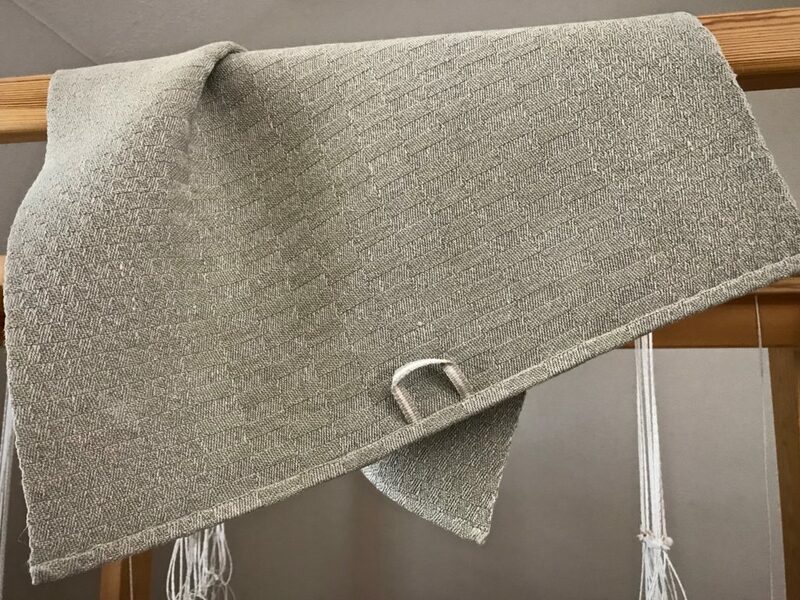 I intend to continue doing the back to front warping until I learn it better…and I will do something in plain cloth, with at least some stripes. Thanks to many resources, I have choices! Thank you, Karen, for this timely message! God Bless! I don’t use a raddle. 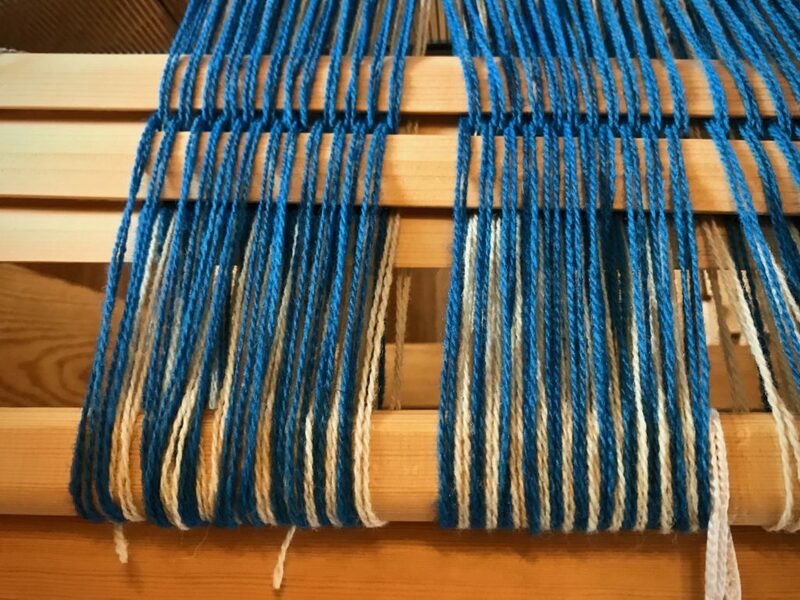 Instead, I pre-sley the reed, which is another easy way to spread the warp. You are right, you have choices! Grace to you, and peace from God our Father. Goodness! They’re going to be luxurious towels. Yourr weaving is lovely as are your words and writing! Hi dear Shari, You are very kind! Thanks, that means so much to me. I love your blog. I am just getting back to weaving after a 20 year hiatus. Your words of wisdom have been a great help. Your talking about cutting off the cloth brought to mind a question. 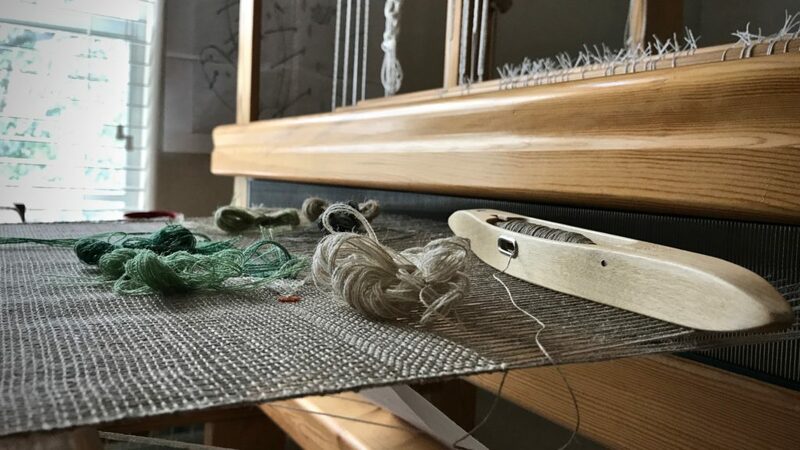 What do you do with your loom waste? 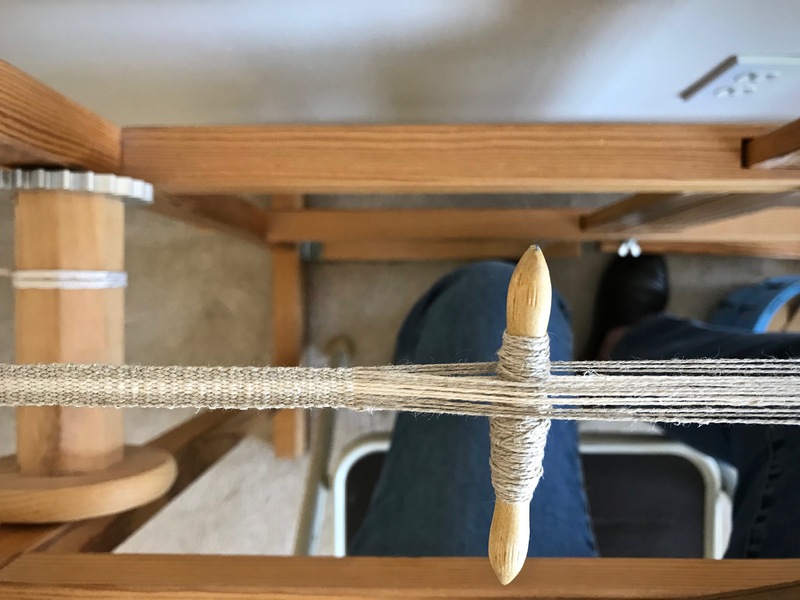 Hi Kay, Welcome back to the world of weaving! I’m so glad you wandered over here. Great question!! Most of the time I discard the thrums (loom waste). However, I cannot get myself to throw away linen. 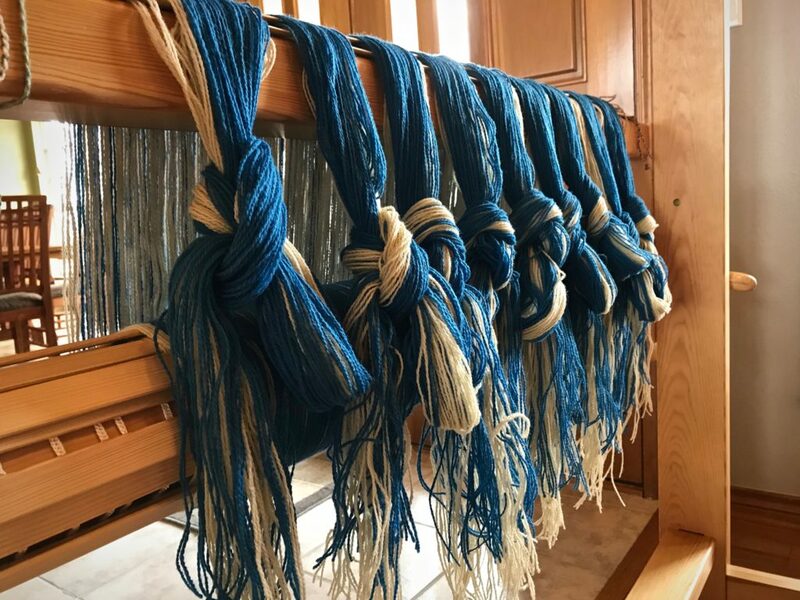 So, I have several short chains of linen thrums hanging in my weaving studio. I have a few other chains of thrums of yarn that was too pretty or too long to justify throwing away. I have used cotton thrums as choke ties, using a few threads bundled together. But I have other choke ties that I prefer to use. There “should” be a good use of thrums, and I’ve heard of a few; but life (and space) is too short to keep everything that “could” be used someday. 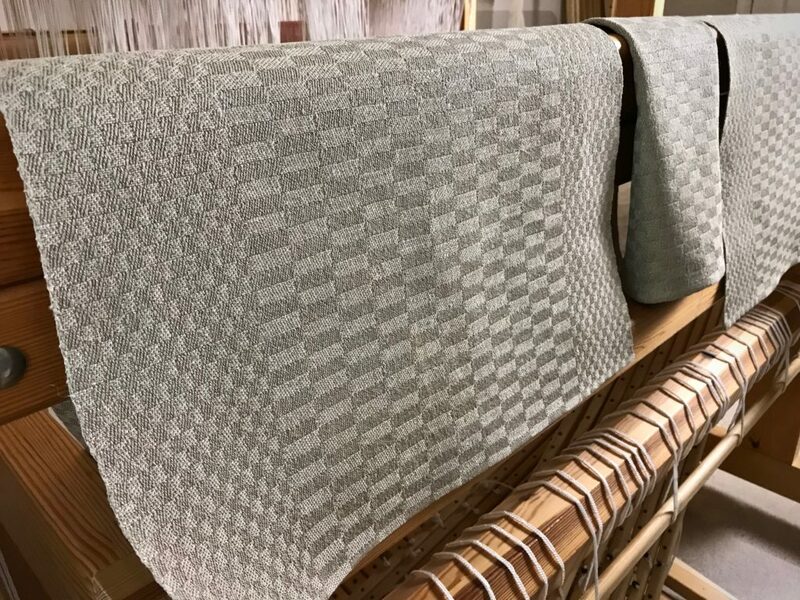 I did find a draft for linen washcloths that uses linen thrums in the weft. 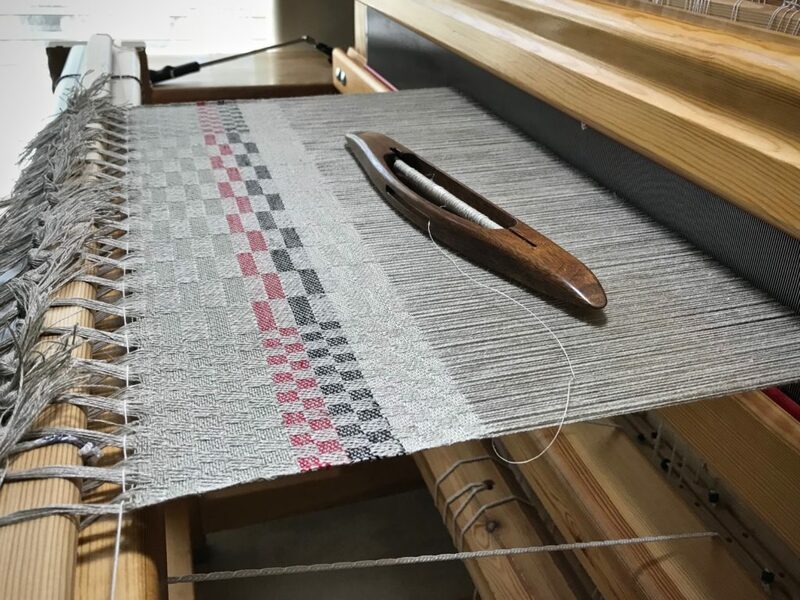 I have that on my list for this year’s weaving, so you’ll see with me how that works out. Who knows, that may open a whole new door for thrums! These are so beautiful! Are they going to be dish towels? 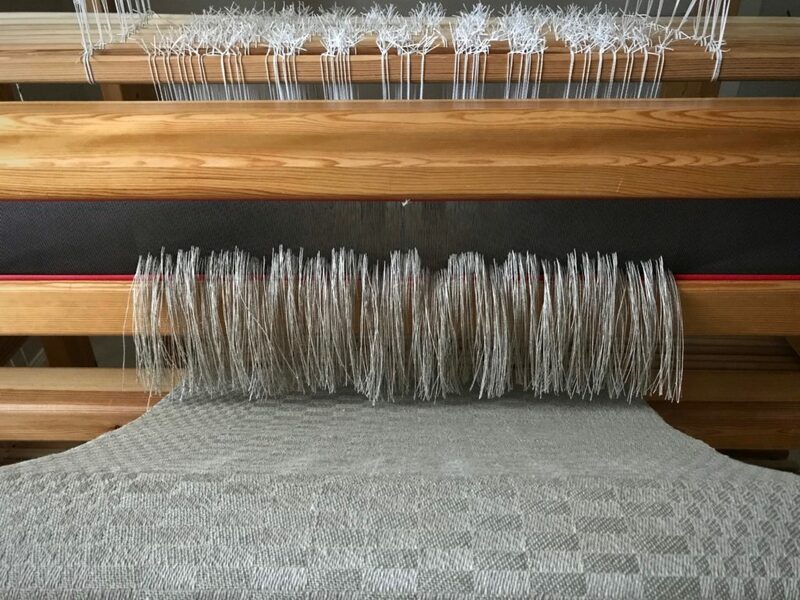 You have inspired me to try this type of weave on my new loom (loom number three and counting)! Do you have a resource for learning how to weave satin damask? Also, what is the weight of the linen you are using and the set? Hi Kathryn, These will be dish towels and/or hand towels. Thanks for asking questions! 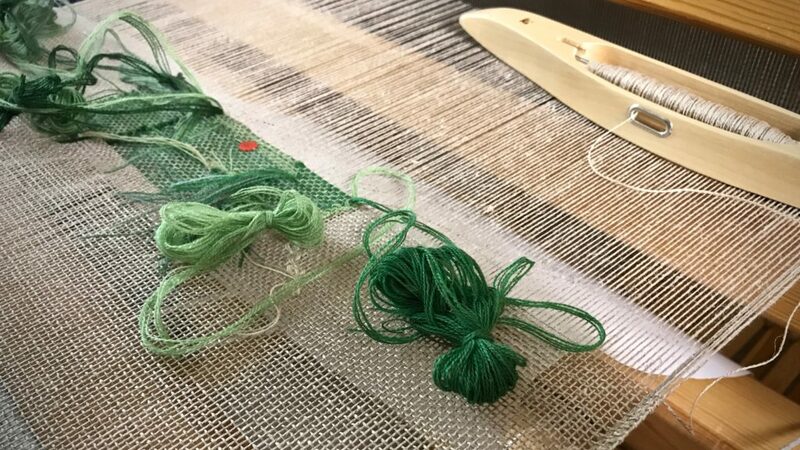 It’s a pleasure to correspond about weaving. 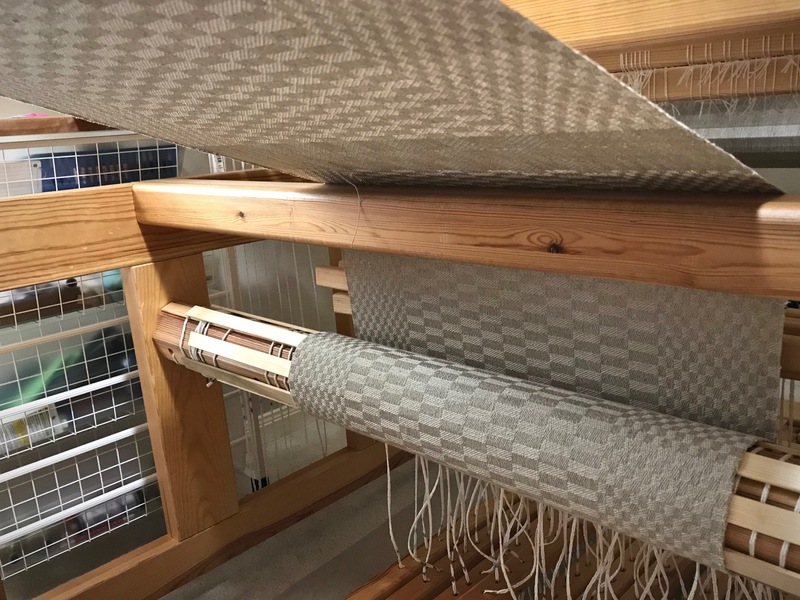 The warp is 16/2 linen. 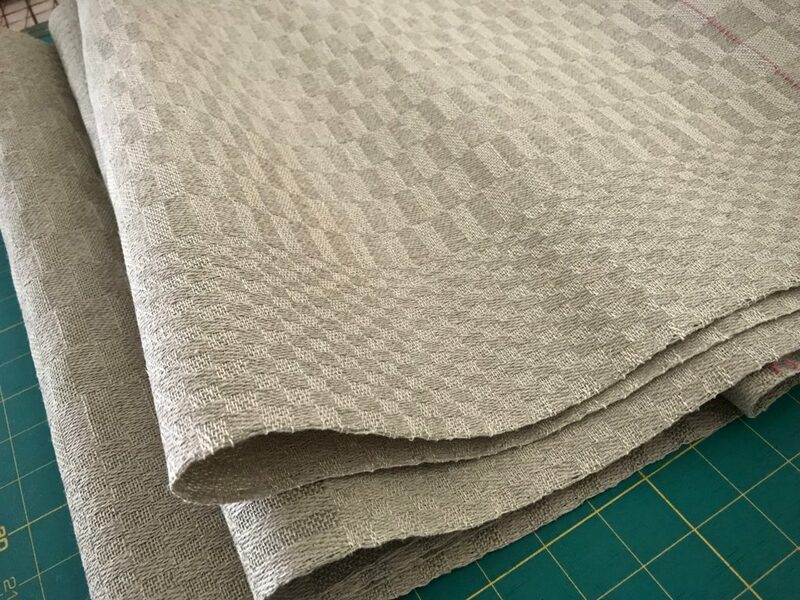 The weft on two of the towels is 16/1 linen, which makes a nice elegant towel. My husband requested that I make some towels that are not as “sweet and sissy,” that are thicker and more hefty. 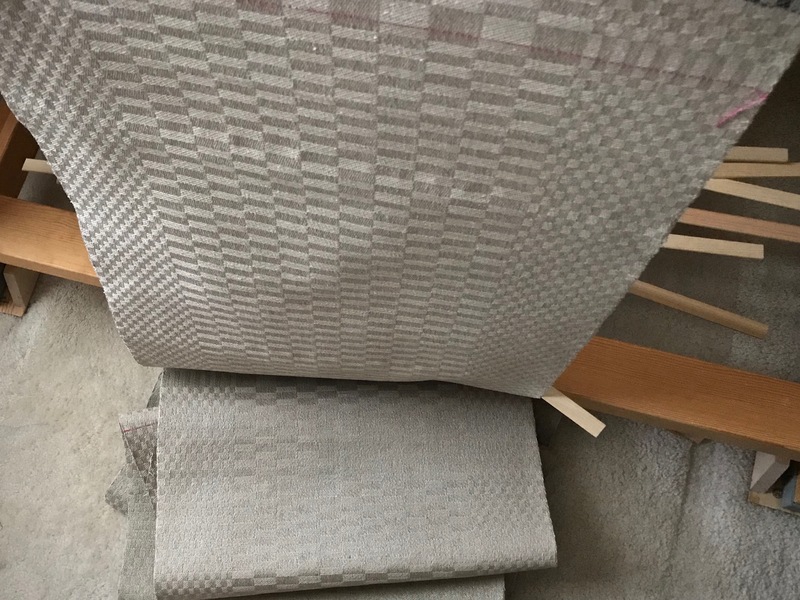 So the remaining towels have 16/2 linen weft. 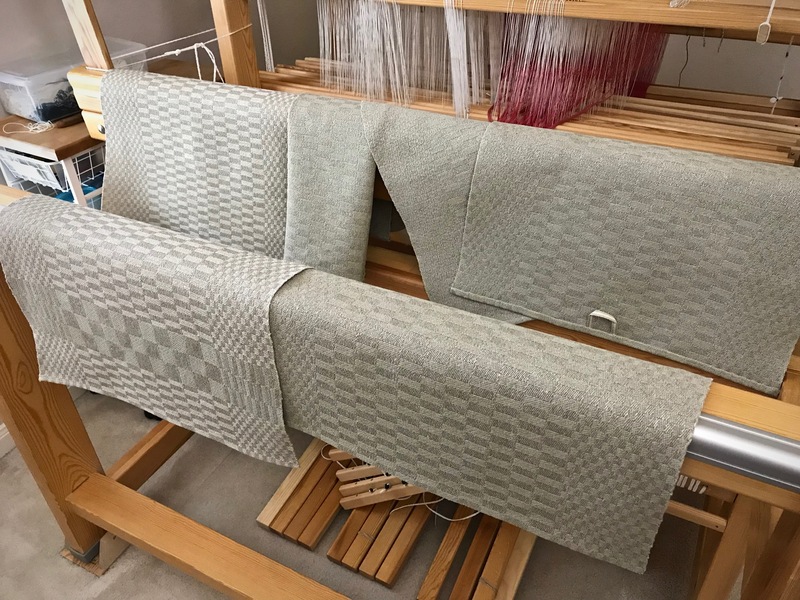 I will know more after wet finishing, but I think these heftier towels will be very nice. If they end up being too stiff I may not cut them apart, and leave it as a long table runner. 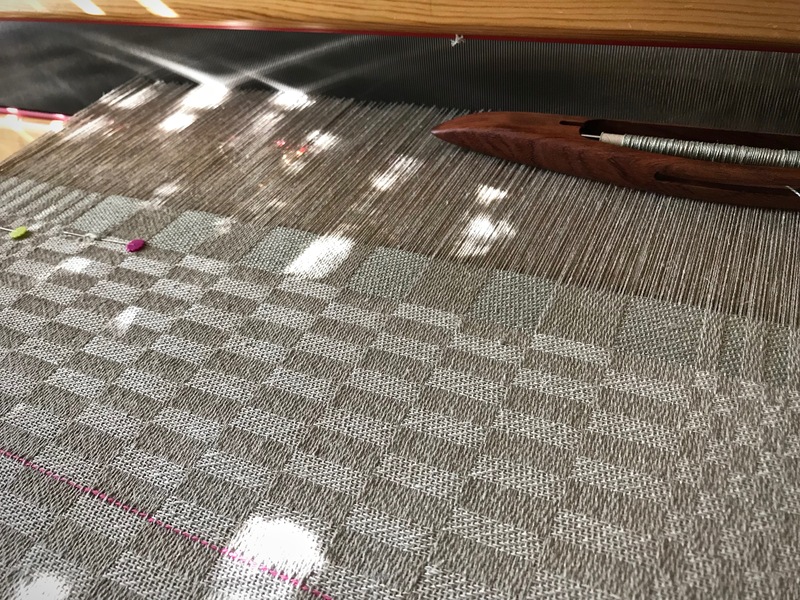 Weaving this satin damask has been so enjoyable that I have already wound a warp to do it again, with a slightly different pattern. And, I’m doing it in 8/2 cotton this time (with a 65/10 metric reed, 13 epc). You need ten shafts and ten treadles for this five-shaft satin in two blocks. I followed the draft and instructions for this from my favorite weaving book, “The Big Book of Weaving,” by Laila Lundell. I am using a 70/10 metric reed, and the sett is 14 ends per cm. With an Imperial reed, comparable would be an 18-dent reed, with 36 ends per inch. Karen, I love these towels. You mentioned that one of the things you do post look is correct mistakes. How do you do this and which mistakes can be corrected off loom. I’m always dismayed upon finding a mistake but have learned that nothing is perfect. Thank you for your blog. I look forward to it. Hi Maggie, You ask a really good question. And you are so right that nothing is perfect. 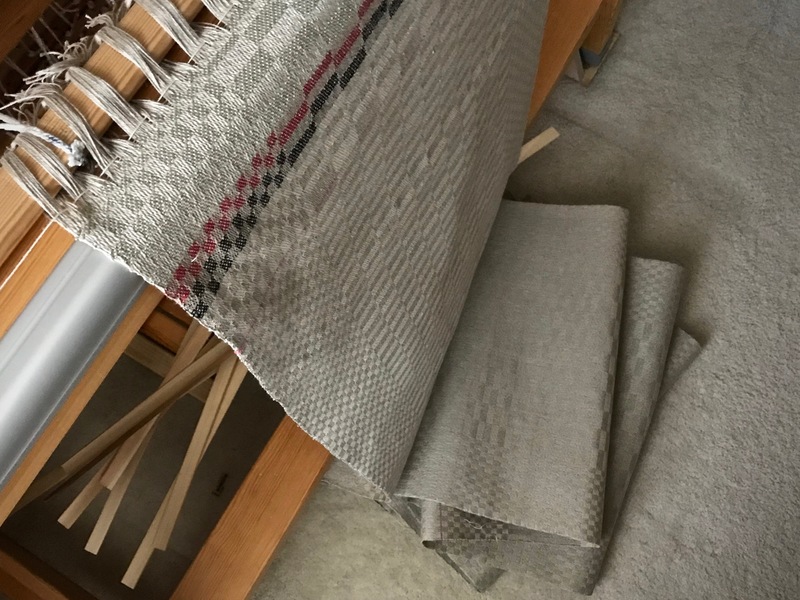 Thankfully, many weaving errors can be corrected off the loom. I think I shall do a blog post when I start fixing the errors on these towels. Thanks for the idea! The main kind of errors I’m looking for are skipped threads or floats. 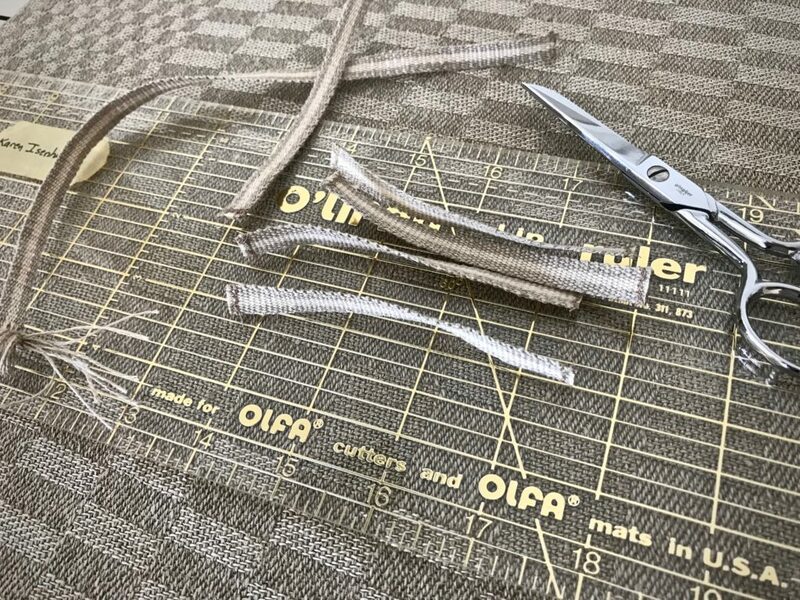 These can usually be corrected, but it must be done BEFORE the fabric is washed. 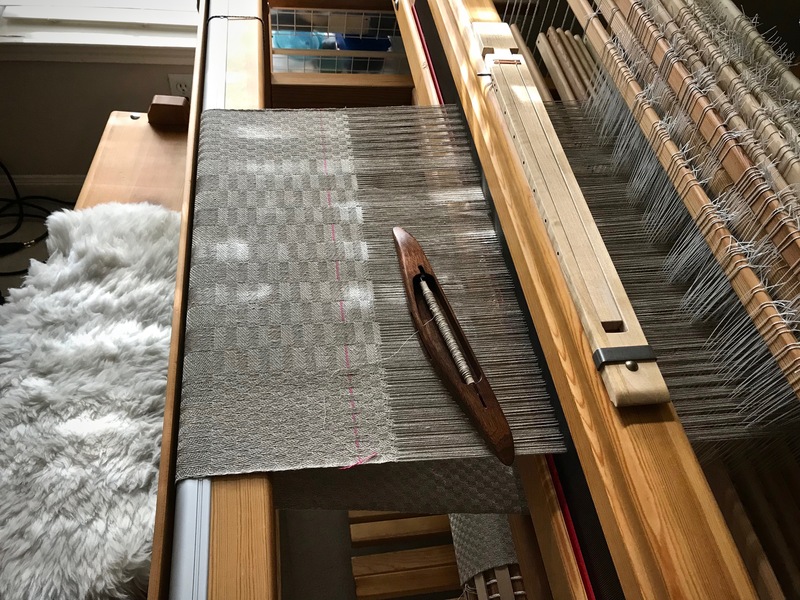 I use a blunt needle and needle-weave the matching thread, warp or weft, in the correct path of the weave, starting about an inch before, and going about an inch beyond the errant float. On a tight weave like these towels, I may need to use a magnifier to see what I’m doing. The other kind of error that I want to take care of is a loop at the selvedge. Depending on the size of the loop, there are a couple ways I handle this. Either, cut the loop and sew it back into the fabric, or needle-weave in a new thread entirely. …or, just leave it and hope it will shrink in enough in the wash. I hope this helps! Look for a blog post on the subject in the next couple weeks. Such lovely towels, I adore the colors and the draft. Hi Martha, I’m pleased with how they came out, too! I’m glad you like them. I found a subject for my next transparency. 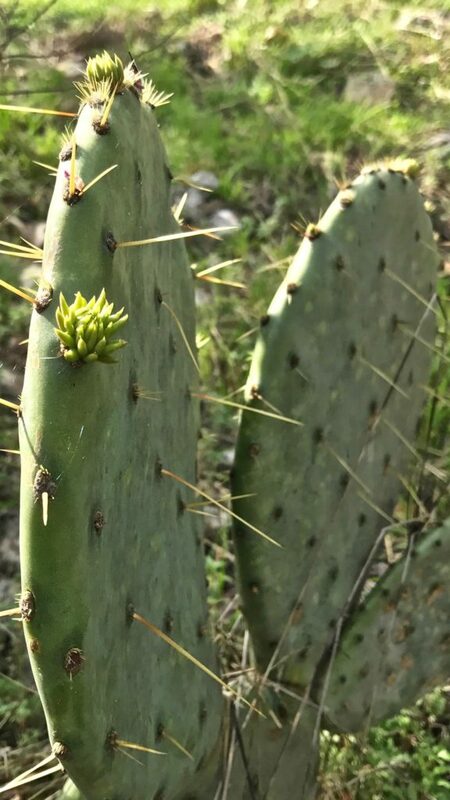 It’s a prickly pear cactus in Texas hill country. 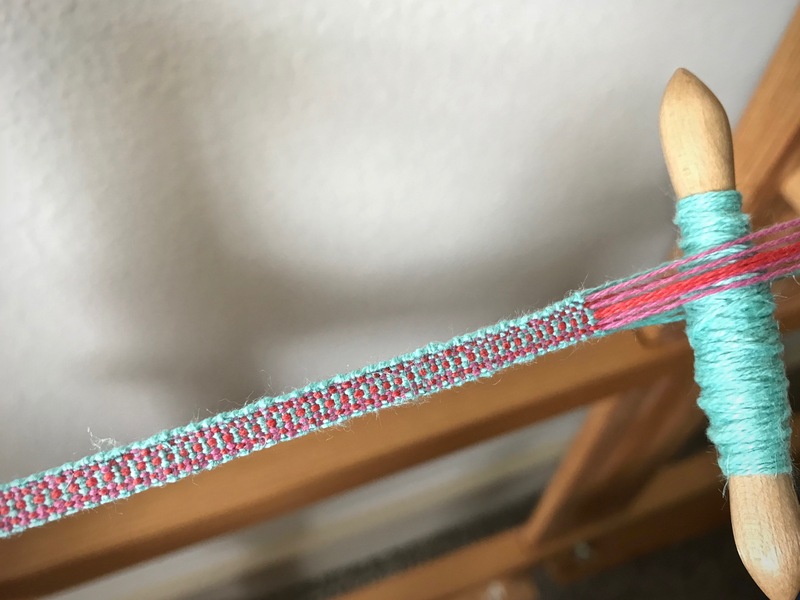 Weaving this cactus is a fantastic experience! I started with a photograph, from which I made a cartoon. And I have an outline that shows where to place each color. It’s all based on the timeless beauty of colors in nature. 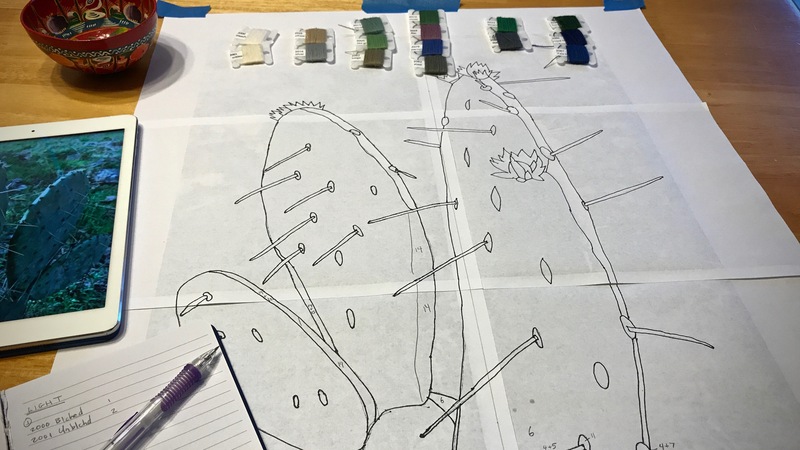 I’m hopeful that when light shines through the final woven transparency we will see a likeness of the original cactus. Prickly Pear Cactus in the front yard of our Texas hill country home. Outline the main lines of the picture. 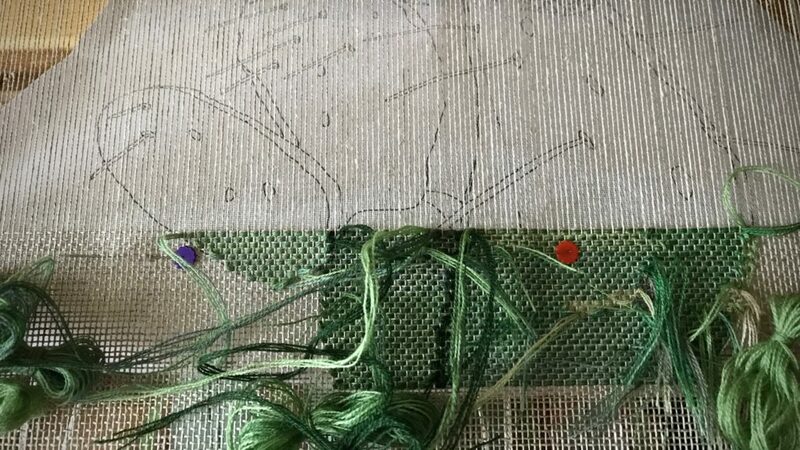 Trace the line drawing onto a piece of buckram to use as the cartoon. Draw a vertical dashed line down the center of the buckram cartoon. 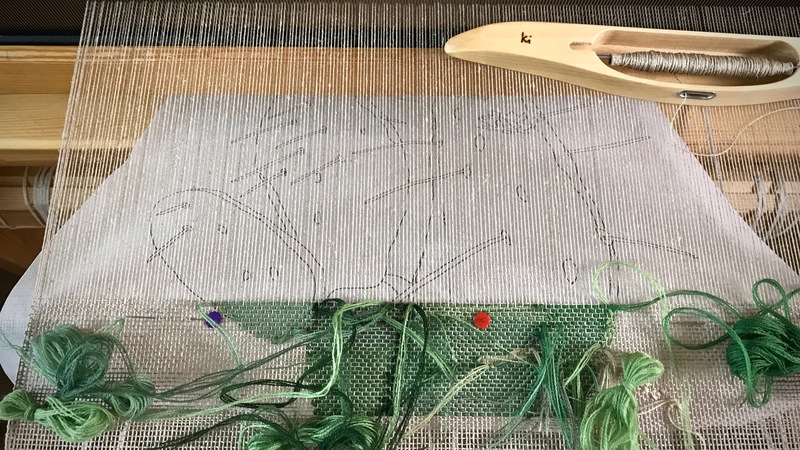 Pin the cartoon under the weaving, lining up the center line on the cartoon with the center warp end. 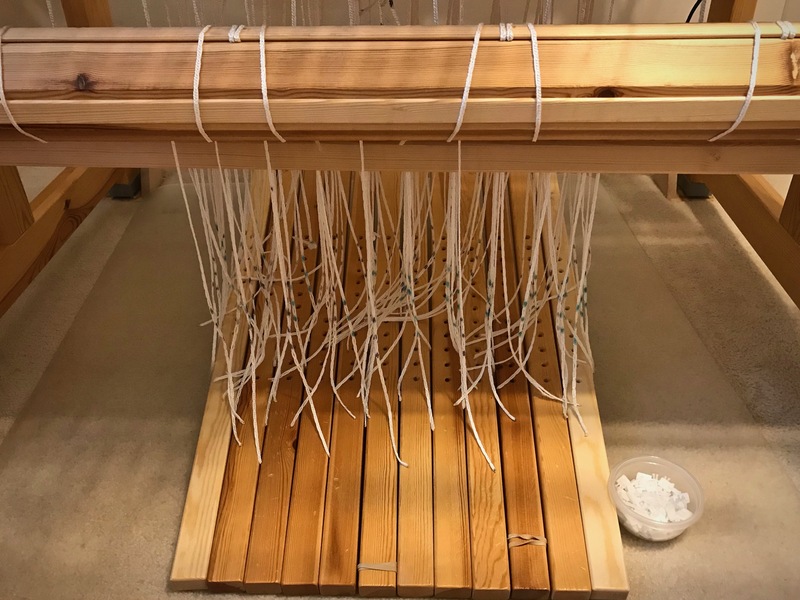 Move the pins, one at a time, before advancing the warp each time. 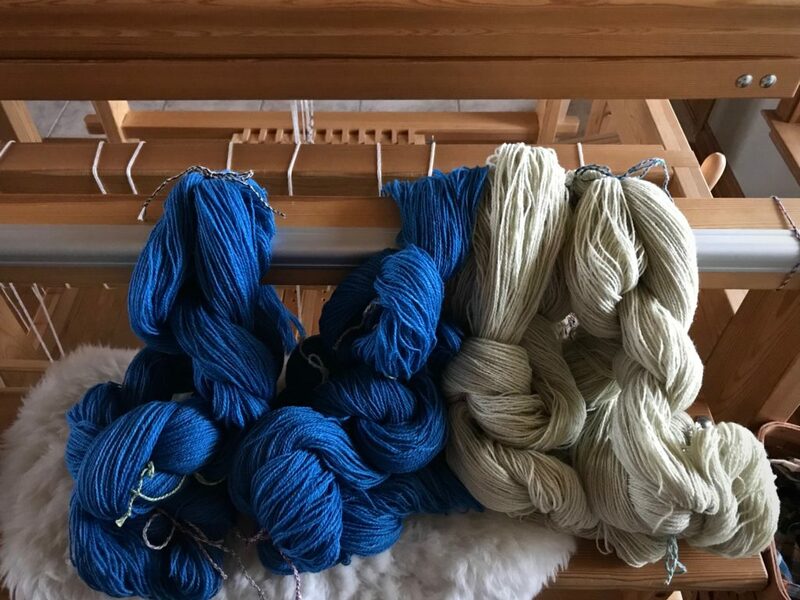 Sort the yarn by hues. (I used my iPhone camera black-and-white setting to help in the sorting.) Sorting by hues helps me blend similar-hued colors, and shows me the contrasts that will help define the picture. Assign a number to each yarn color. Virtues are timeless. Virtues are like colors that blend together to weave a masterpiece. 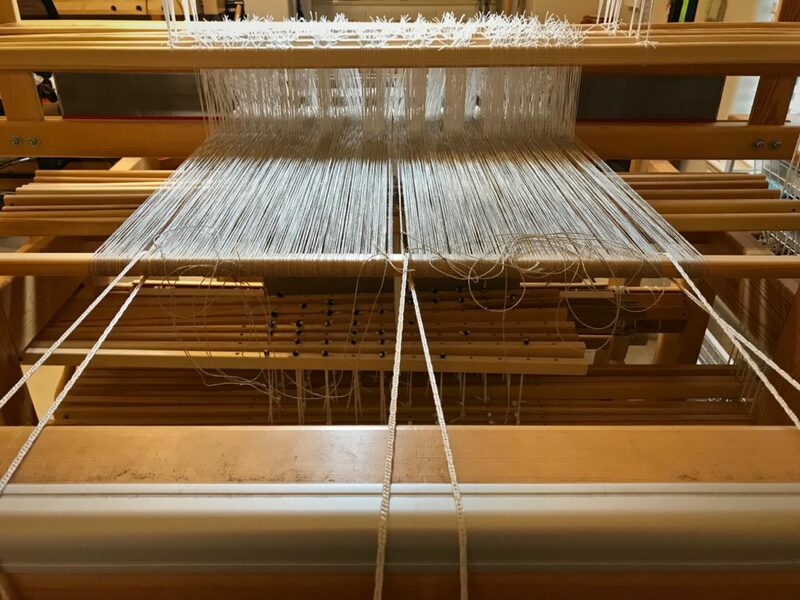 When we let the Grand Weaver lay in the weft, these are the colors that appear as light shines through His woven transparency: love, joy, peace, patience, kindness, goodness, faithfulness, gentleness, self-control. And when this occurs, it shows that we are made in His image. May the next leg of your journey be a fantastic experience. I’ll meet you back here on Tuesday, August 1st, 2017. In the meantime, I hope you investigate claims of Jesus. Take time with people. Keep weaving. And the same for me. Head over to Instagram to stay in touch with my daily journey. Good morning, Beth, I hope it will be! I know it will be fun to work on, in any case. So exciting to see your transparency! 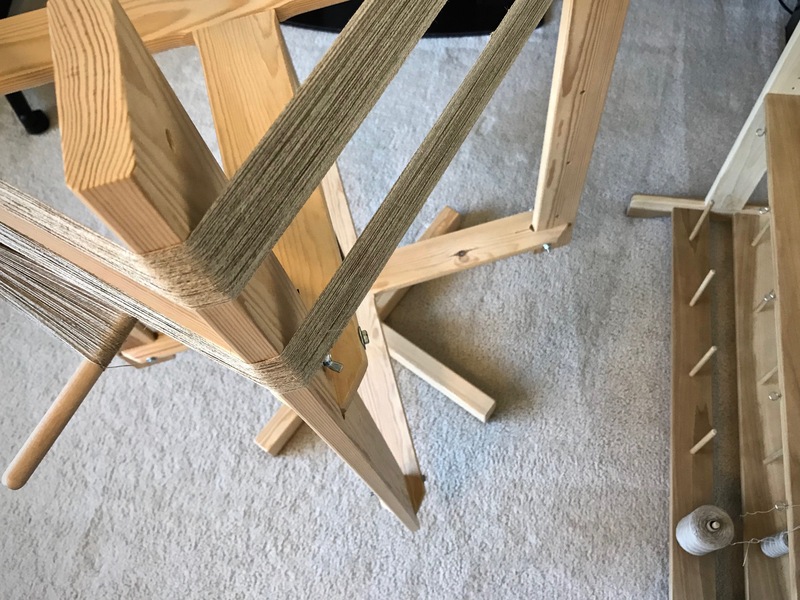 That is my absolute favorite thing to weave, and yours is inspiring me to do another one too. What size linen and sett are you using? Hi Lynette, You are responsible for inspiring me! I couldn’t stop thinking about your beautiful transparencies, and knew I wanted to make another attempt. It’s not hard for me to understand why this is your very favorite thing to weave. I may be following you in that! I can’t thank you enough for answering my questions behind the scenes! This is 16/2 linen, 12 epi. You’ve put lots of planning time into this piece. Can’t wait to see the finished work! Hi D’Anne, The planning for this has been a lot of fun. I was getting discouraged trying to find a good subject to weave, but when I found this pic that I took on our own property I got pretty excited about the whole thing! I can’t wait to show it to you when it’s finished! This is so exciting Karen, I can’t wait to see it!! Have a wonderful vacation, I will be looking forward to august and this finished piece! Hi Liberty, Yes, it is exciting! Thank you. 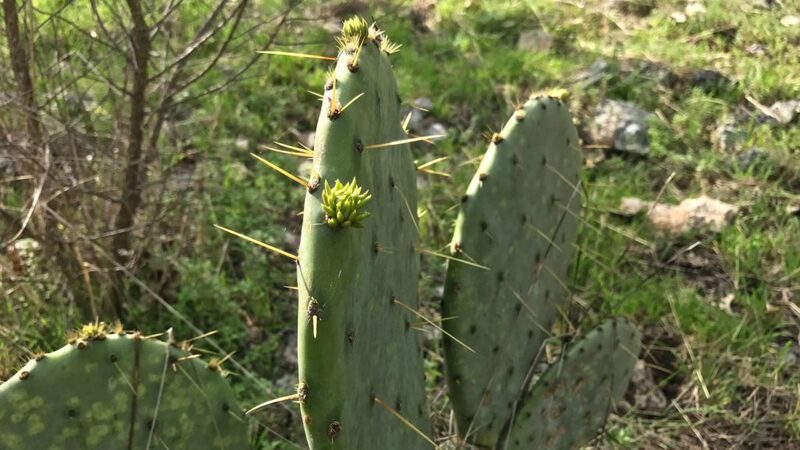 I will be eager to show the finished cactus, I’m sure! Where in the hill country do you live? I so enjoy your blog- I like how you “weave” your faith in your posts!! 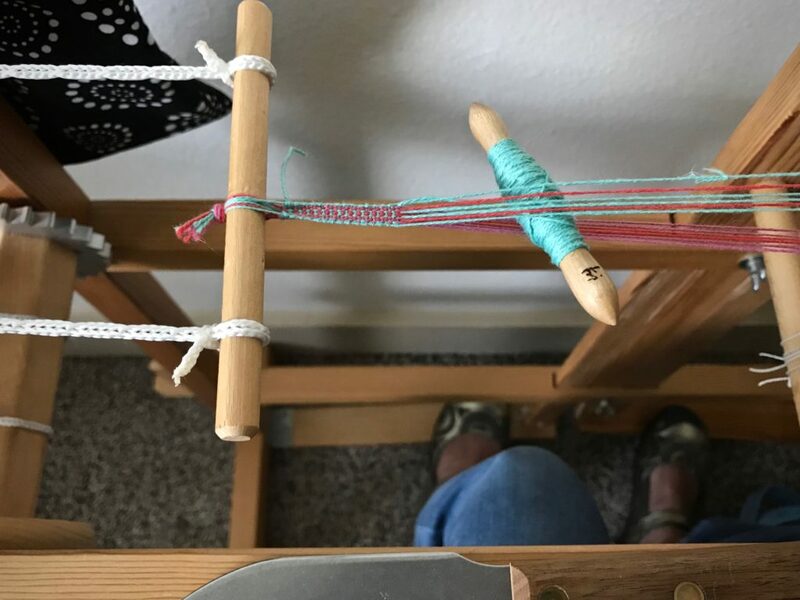 Gifted weaver and writer? Maria, We are a little north of Kerrville. We currently live in the Houston area, but this special place in Kerrville will become our permanent home when my husband retires. Your sweet thoughts are very touching. Let me know when you will be in Houston again, or in hill country. I’d love to meet up. I am so glad I found your site! I love everything and have a lot to learn! I love how you try to do every so nice and neat! Hi Carol, It’s wonderful to have you here! We’re all learning, so this is a great place to learn together. Great blog! Thanks for posting so much info. Hi Patricia, Welcome! I’m glad you’re here, and that you’re finding information that suits your needs.